Halibut is the largest salt water flatfish that inhabits icy cold ocean waters. The flesh is firm, yet flaky when cooked. It is a delicious white fish that holds up well to being grilled. Halibut will eat just about any fish or shellfish that it comes in contact with. That may be why it is so tasty. Halibut can dry out when grilling, so you will want to add some sort of fat to the grill plates when cooking this fish on a George Foreman Grill. Any of the grills will work, especially the panini style with the hinges that lift up to make some even spacing between the grill plates, so as not to squash the fish. It will also cook more evenly. Both halibut steaks and fillets will grill fine on a Foreman Grill. 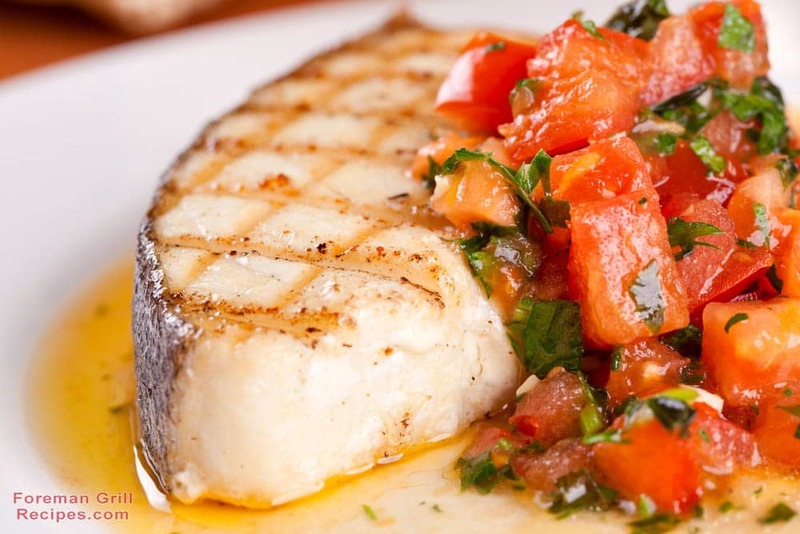 Here is a basic grilled halibut steak recipe. In addition to the basic recipe, this has been jazzed up with a blistered tomato salad. The combination of the two makes for a complete savory dish that has a hint of sweetness. A Foreman Grill can be used for both the fish and the vegetables/fruits. Grilling tomatoes brings out their naturally sweet side. A little balsamic vinegar adds another dimension of subtle sweetness that both the halibut and tomatoes can stand up to. Feel free to pair the basic halibut recipe with your own salad or side. This recipe is for 2 servings. Adjust accordingly for the number of people you will be serving. You can tent some foil over the fish to keep it warm while you grill additional steaks. 1. Turn on the Foreman Grill and let it warm up to around 375° F.
2. Prepare the halibut: Place the EVOO (extra-virgin olive oil), lemon juice, salt, and pepper in a baking dish or sealable baggie. Pat the steaks dry. Place the fish in the dish or baggie and turn to coat with the marinade. Allow the fish to marinate for 10 minutes at room temperature. 3. Place the tomato halves, skin side down, on the grill and cook until the skin just blisters. You don’t need to put the top down. This will likely take a minute. Remove the tomatoes and set aside to cool. 4. Mix the EVOO, vinegar, salt, and pepper in a large bowl. 5. Brush both grill plates with EVOO or a little butter. Grill the fish with the top closed for 3 to 5 minutes until the flesh is opaque and flaky in the center. Grill the lemon slices at the last minute. 6. While the fish is grilling, mix the tomatoes with the vinaigrette. Place a handful of arugula on each plate, top with tomato salad, then basil. Place the fish over the salad and top the steaks with grilled lemon slices. Serve immediately. Serve wedges of crusty Tuscan bread or gluten free flat bread on the side to soak up the salad dressing and fish drippings and to round out the meal. Aside from the fact that halibut is a mild, yet tasty, fish it is incredibly rich in omega 3 fatty acids and protein. 160 grams of halibut provides us with more than 1,000 mg of omega 3 and over 40 grams of protein. Halibut contains no trans fats. Omega 3 fatty acids are critical to maintenance of our cell membranes. Our bodies cannot produce omega 3s, so we have to get them from food sources. Without omega 3 fatty acids we are less likely to be able to prevent and fight certain diseases. Grilling fish over an open flame outside imparts a nice smoky flavor. The only problem is that the flames licking at the fish are generally too intense for the delicate flesh. While halibut is pretty meaty and can stand up to some heat, direct flame grilling just seems to dry it out. The Foreman Grill method of cooking fish helps to retain the moisture. Plus, it takes only minutes without the mess. A good tip is to place the grill on your stove or range top so that you can turn on the exhaust fan to draw out any fishy odors. The Foreman Grill produces less of that than grilling on a an open flattop. No one likes their home or apartment to smell of fish. Keep in mind that you can always grill your fish outside on the Foreman indoor/outdoor electric grill.